Sometimes, when I post my droid pictures on my Tumblr blog, I write a little accompanying text. Sometimes this is just a quick one line description of the droid, or how I’ve drawn it, but sometimes I write a description that hints at a future history of these droids. Designed and built in ‘74 by Kinetic Energy Systems Inc., the A.D.D. first saw use in the defence of the Olbers way station on Ceres. Shipping with both an Atlas-class Railgun and a Sigma-rated Plasma Cannon, the A.D.D. is a very capable weapon. With an onboard A.I. of .08 Human Analog, the drones can be deployed and then forgotten on the battlefield as they calculate the best way to achieve their orders. Currently the onboard A.I.s have recorded only one psychotic failure [see History of Belt-Mars Conflict: Vol VI: Ch 8.1 Brodsky]. Built by Hurricane Industries for Law Enforcement, Riot Control, Crowd Suppression and Compliance. Strong and agile, with a high category A.I., the H.C.U. is equipped with both lethal and non-lethal tactical weapons, including: Low Velocity Kinetics, Tasers, Sonic Cannon, Microwave Lasers and standard MKIV mobile Rail Gun. Eddie was built as a general purpose droid in late ‘78 and was shipped to Mars that same year to work for the Terraforming Committee. After 8 years of hard work, Eddie was sold to the owner of an algae farm in the new northern ocean. The algae farmer didn’t see robot rights as important and didn’t treat Eddie with much care or attention. In early ‘90 tax officials visiting the farm found no trace of its original owner, discovering Eddie in charge of operations. The ensuing legal case saw Eddie evicted and from that point on his antipathy to human kind was fixed. During the next decade Eddie could be found at most of the major flare-ups between humans and robots. The last anyone saw of Eddie was during the Tharsis Rebellion of ‘08 where he was seen at the heart of the robot offensive, brandishing his favoured plasma cannon as the Phobos Space Elevator came crashing down. Rumours of Eddie’s survival have persisted, even though it’s now nearly 30 years seen he was seen. These rumours have been strenuously denied by the Human government of Mars. I love the vague, hinted at history of far future conflicts hinted at in these descriptions. I don’t think I’ll ever write all the connecting information, better to allow people to fill in the gaps themselves. I do have a rough framework of a timeline in my head, although I’m scared to write it down in case it ties me down to a particular set of events. I like to draw the droid, and then just see what suggests itself. That way I can be surprised too. What do you use for the formal element of shading and lightsource? Not quite sure i understand what you mean by ‘formal element’? How the illustration is built. Anyhow, how do you shade your drawings? Like what do you use? 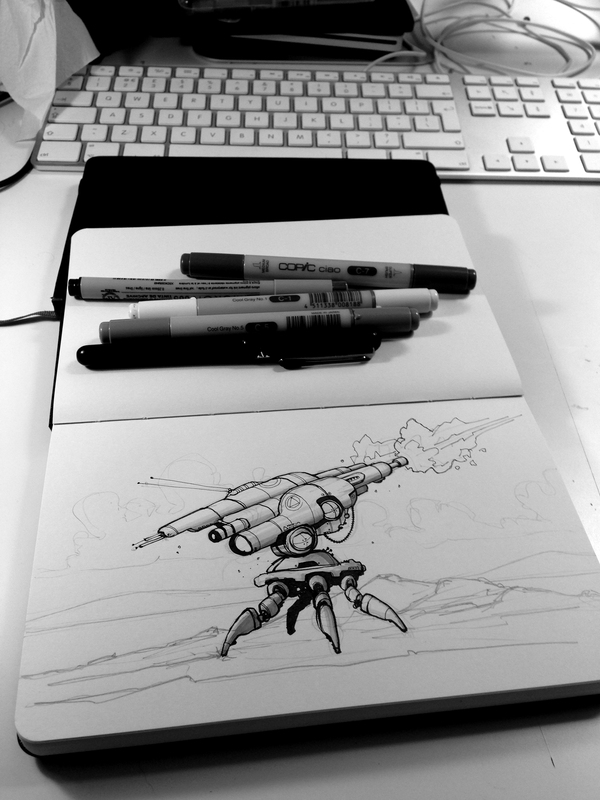 I use a variety of pens – Staedtler Pigment Liners, Sakura Pigma Microns, Pentel Pocket Brush. And for colour I use Copic Ciao Markers.